The Car Plays are Revving Up in San Diego! Still trying to figure out what these "Car Plays" are that I keep mentioning, as they move from the Radar Festival in LA to the Off-Center Festival in Costa Mesa, and now to La Jolla Playhouse in San Diego? Click here to see a lovely little television news feature about Moving Arts' wonderful site-specific theater production, featuring creator and producer Paul Stein, Michael Shutt, and a bunch of our fabulous Los Angeles and San Diego actors, working together to make this latest production happen! Click here to see another television feature, this one from the local PBS station. We're getting lots of love in San Diego! Or click here to see a review in the San Diego Union-Tribune. Or click here to see a review in the North County Times. Or click here to buy tickets to the La Jolla Playhouse production of Moving Arts' "The Car Plays!" I'm proud that my play "Reveille" is part of the mix. Big News! $10,000 Fellowship from the NJ Arts Council! The big news this month is that I'm the lucky recipient of a $10,000 Fellowship in Playwriting from the New Jersey State Council on the Arts. I drove up to Summit, NJ a few weeks ago to accept the award, along with other recipients in five categories, at their Annual Artists Roundtable. Twenty-two artists were selected from more than 300 applicants in the categories of crafts, sculpture, photography, playwriting and poetry. The money will help me make it through the rest of the year -- which is rapidly filling itself with a wonderful array of productions, publications and teaching gigs. Thank you, New Jersey, for helping me to be a full-time playwright for a little longer!! A nice article about local playwriting recipients in the Star-Ledger. Three of my short plays are getting some attention this Valentine's Day month. "Reveille" is in Moving Arts' The Car Plays -- which is roaring into the Without Walls Festival at La Jolla Playhouse in San Diego, CA. "Partners" is in the Briefs Festival in St. Louis, MO. And "This Isn't About Love" has been featured in Eleven Eleven -- a biannual journal of literature and art published through the MFA Writing Program at California College of the Arts in San Francisco. "This Isn't About Love" is about a lunchtime tryst between two lovers in a hotel room; one of them wants something the other might not be ready to give. Click here to read "This Isn't About Love." Look at the rest of the journal while you're there! February 24-26 -- "Partners" in the Briefs Festival in St. Louis! 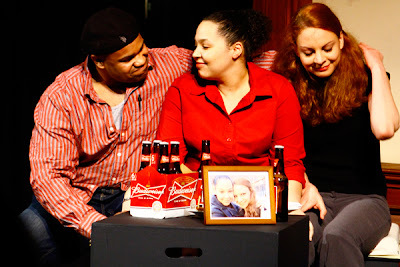 From February 24-26, 2012, my short play "Partners" will be showcased in the Briefs Festival in St. Louis, Missouri, produced by That Uppity Theater Company, in partnership with Vital Voice Media. "More than a traditional theatrical production, BRIEFS is a community event, innovatively bringing together a diverse audience from the LGBT community, straight allies, local businesses, and local artists and involving eight different directors and playwrights." "Partners" is one of my most popular ten-minute plays. It's a comic little piece about a cop who brings her male work partner home to meet her female *partner* partner, and the fireworks that ensue. It was most recently seen in Boston, at Another Country Productions' SLAMBoston event. I'm proud to have it included in the St. Louis event. For more information, check out this article by Vital Voice Media or this feature in West End Word or this article in Alive Magazine. Finished a draft of a new full-length play! Now... delving into the rewrites! Passage Theater Playwrights Lab Retreat! David Hilder, directing our merry little band of actors. Characters, from left to right: Brett, Hayden, Hal, Donnie, Miriam. Characters at the music stands: Brett, Hal, Donnie. Grieving mystery novelist Hal Walker has been sent by his editor, Brett Martin, to the home of Donnie Lawrence -- infamously acquitted in the murder of his wife. But Hal didn't anticipate the presence of Donnie's teenage daughter, Miriam, nor the emotional undertow that his own wife's death creates as he attempts to ghostwrite Donnie's book "My Story."